The Coordinator of the Korogocho Community Justice Centre Michael Odhiambo and I paid a courtesy call to Koch FM – 99.9 FM. The station is based in Korogocho, the fourth largest informal settlement in Nairobi County. Koch FM was the first community radio station to be established in any informal settlement in Nairobi County. The community radio station is located inside the Chief’s Camp in Korogocho. As you go through the Chief Camp’s gate, one can easily spot Koch FM which has a painting of a hand holding a microphone with the words Edutainment written just next to the station’s main entrance. At the reception we were welcomed by one of the journalists who was preparing for the afternoon show. The station has a reception area where we were ushered to by the journalist. There is a small radio placed at the reception where we could hear one of the station presenters giving breakdown of how much a balanced nutritious cooked lunch would cost in Korogocho. Koch is a nickname derived from Korogocho which means ‘crowded shoulder to shoulder’ in Swahili. Koch FM was established by young women and men from Korogocho who wanted to tell Korogocho stories from a positive perspective as opposed to the discriminative way mainstream media depicted the community. Korogocho community faces many challenges some of which are human rights violations. 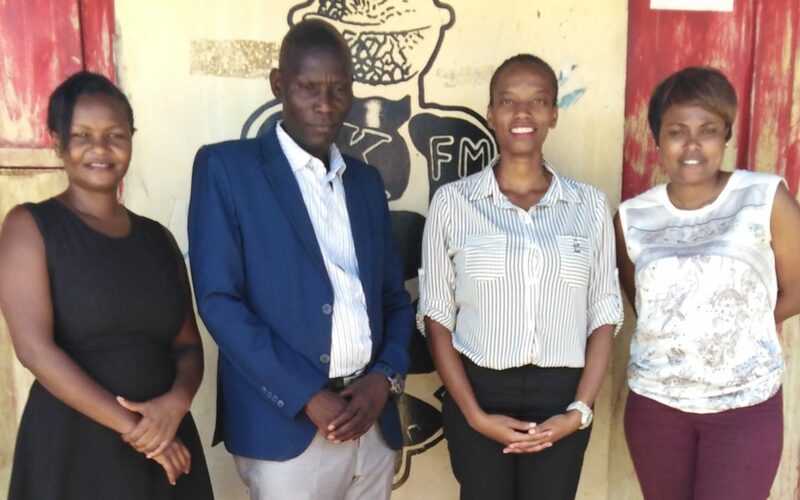 The main aim of the community radio station is to provide a platform for the community to address the different issues they face through information sharing, education and communication. Koch FM has a 5km radius and the coverage area includes Korogocho, Dandora, Huruma, Mathare, Baba Dogo and Lucky Summer. This is a population of about 250,000 people. One of the unique features about the radio station is that it has an online newsletter whereby the different programmes aired are put online and especially on social media to reach many people. The aim of the visit was to introduce Citizen Justice Network (CJN) which aims to build journalism capacity for paralegals to develop stories on social justice issues and further provide training and editorial guidance to the paralegals to enable them broadcast their stories in Swahili. CJN will be working through Kituo Cha Sheria whose main mandate is providing legal aid services to the poor and marginalized members of the society. CJN aims to nurture a partnership between Koch FM and Korogocho Community Justice Centre who have over the years enjoyed a good working rapport through Kituo cha Sheria by airing advocacy campaigns and also participating in human rights violations talk shows. The representatives of Koch FM were receptive to the project and further gave more insight on the programmes they run at the radio station. This partnership will further help with Korogocho FM’s mission which is to promote social, political and economic well-being of the Korogocho Community.